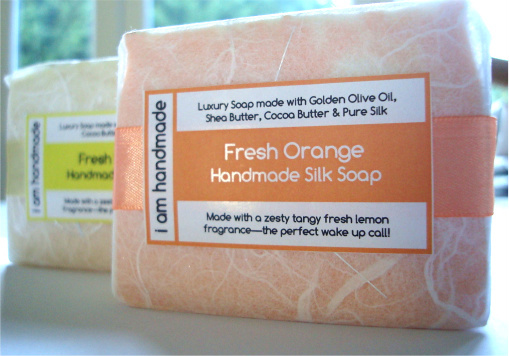 I've been working on my packaging and labelling style for my cold process soaps for what seems like forever. I keep having ideas and trying them out and either not liking them at all or liking them a little bit, but not much. I seemed to get it almost there but never had a Eureka moment. I started off wanting to use something biodegradeable and thought of real cellophane film. Not the cellophane that is generally sold (the type florists use) which is actually polyproplene but real cellulose which is made from natural products and is fully biodegradable. However, as much as you can buy this from what feels like every second store in the US, trying to get it this side of the pond seemed next to impossible. Then I wanted to use handmade paper - a lot of handmade paper is very thick so wouldn't be suitable or is rather expensive. There are some really beautiful papers out there but I seemed to trawl through the net as much as I could and found the product I wanted but then they were a) too expensive or b) wouldn't send to Ireland. Friends kindly offered to send to them to the UK and they'd send on to me but that isn't sustainable into the longer term for financial reasons plus I didn't want to drive anyone nuts either. 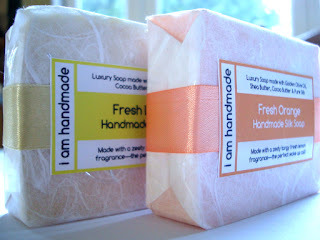 I tested some lovely mulberry tissue that I found at a great price on ebay of all places and really liked it. I finally decided to choose the white paper with silver threads which I thought was classic and beautiful. 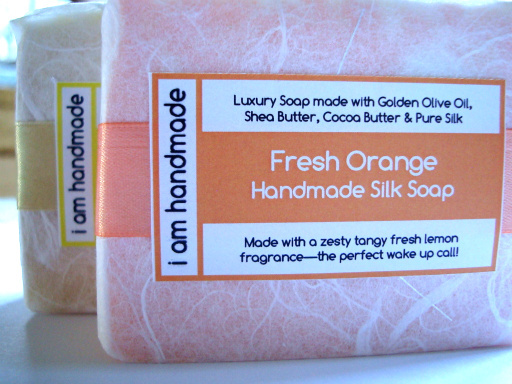 It was thick enough to cover the soap well but thin enough to allow the customer to see the colours of the soaps plus be able to smell the fragrances though the paper. So once I had the paper, I worked on the labels. 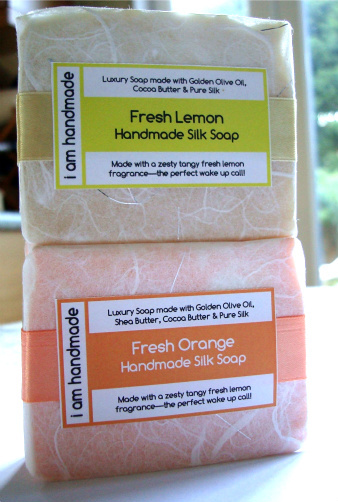 As I was using white paper, I wanted to introduce some colour into the labels but also not overpower them. I needed to fit in all the regulatory labelling issues plus make that look attractive too (as any soaper will tell you, that can be very tough!). 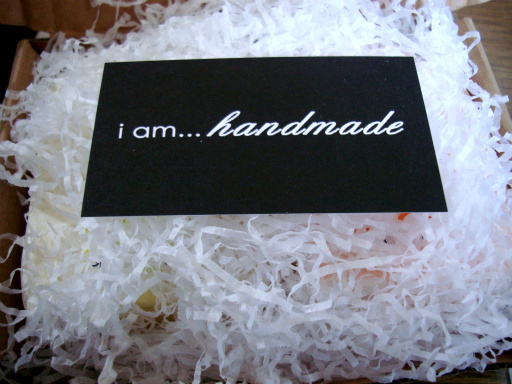 I wanted to include the I am Handmade brand into the labels too as it so wonderfully reflects exactly how all our products are made. Once I had the labels, I put them with the wrapping but there was still something missing .. and, yet again, I found the answer on ebay in the form of lots of satin ribbon! I've ordered about 24 different colours (oh I was in heaven with them, I just so adore colour) and once I'd put everything together, I had my EUREKA moment! 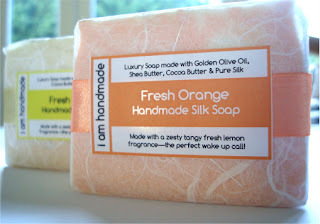 Below are some images of the wrapping... please note that the label for the Fresh Orange soap is slightly incorrect because it says it has a lemon fragrance.. well, of course it doesn't, I just didn't change that bit from the Fresh Lemon labels (how utterly annoying to find that once you've printed them and cut them all out!). You look at a thing long enough and you can't even see it anymore! Argggghhhh.. oh well, I can re-print and re-do, I prefer to have it right! colours, I didn't have a bright yellow ribbon - might have to remedy that! 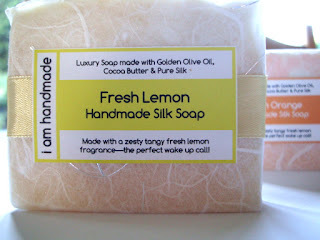 Arrggghhh at the typo on this label, I'm reprinting as I type! I really hope you like my new packaging - as any soaper will tell you, sourcing packaging that exactly matches the image you have in your head, for a good price and as locally as possible is next to impossible. My advice... check out ebay!! Those look great. I feel your pain on trying to decide on packaging. Everything that seems so great in my head comes out so bad when I do it. They're beautiful! I love the colors and how you can see the color of the soap through the tissue. Great addition with the ribbon too, it adds a very finished look! Royal Suds - oh yeah, packaging can drive a person mad! The best thing is to try as much as possible and see what works best. Anne-Marie, thanks so much, I think the ribbon really finishes it off perfectly. I'm really happy with this now. Just simply beautiful, I love it and it's very classy looking. The ribbon and label work so well together. Yes, packaging is always an issue. I really like your new labels, Celine - handmade, modern, clean looking and the white paper is adorable isn't it. Well done, you've worked so hard, and it shows! Ughhh I feel the same way! I keep changing my soap packaging and never seem to feel like its "the one". I know I want to continue to sell unwrapped soaps at the market, but I am trying to add more wholesale orders, and wholesalers don't really like the idea of unwrapped soaps. I bought some shrink wrap, and it is in the mail so I will have to see if I can shrink wrap it and then design a sticker label to go on the front. But then comes the issue of paper and printing. I have contacted several label companies to sample their papers - I am looking for glossy, waterproof, laser printer paper! Whew. Becky, Michelle and Polly - you are totally beautiful women! Thanks so much for your lovely lovely comments. I'm blushing now! Caitlin, I guess I'm lucky, in a way, because I don't do markets, I only sell online and so I only have to think of one way to wrap; there are always other considerations to take into account if you do wholesale or markets too - the key is to get the one-look-suits-all look!!! 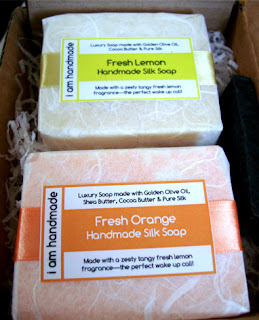 Your soaps are just so lovely! Something Soapy - thanks so much; its incredibly hard to find things in Ireland too, I often have to buy from the UK which, even though not that geographically far away, you'd swear we were in Outer Mongolia the way some people think about shipping!!! Thanks everyone, for your lovely comments!!! I love it so much!! 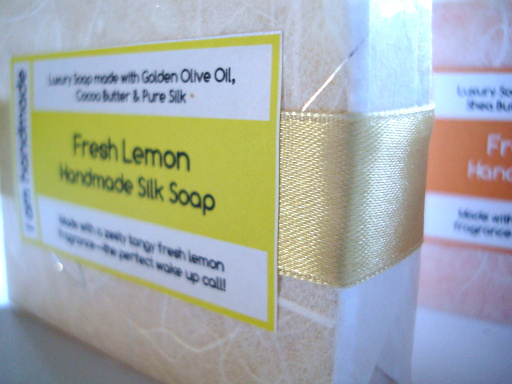 The paper is perfect, the colors are perfect and aside from the typo, the labels are perfect too! I have battled with packaging (as I'm sure every soaper has) and have recently started using ribbon too :) I luv it and I think it gives the soap that little bit extra that really seems to catch everyone's eyes. After reading this post I instantly thought of this really cool Plantable Paper I came across while cruising various soap sites. It's a little expensive for my taste but I think you'll get a kick out of it. I try to keep my packaging to a minimum just to cut back on waste and I thought it would be super cool to have a label that you could plant and actually have flowers grow from it! I might splurge some day and try it out on a limited bar or something. I'll keep you posted. Lindsay - ribbon does add something for sure; I love the feel of this too, so satiny and smooth. I've seen the plantable paper and I can get it from the UK but it's pretty pricey and I needed a self adhesive label too so I ruled it out. But it's a great idea and I can see that it could certainly have marketable opportunities!